Bulk MD5 Password Cracker: Tool for cracking Mass MD5 Hashes. 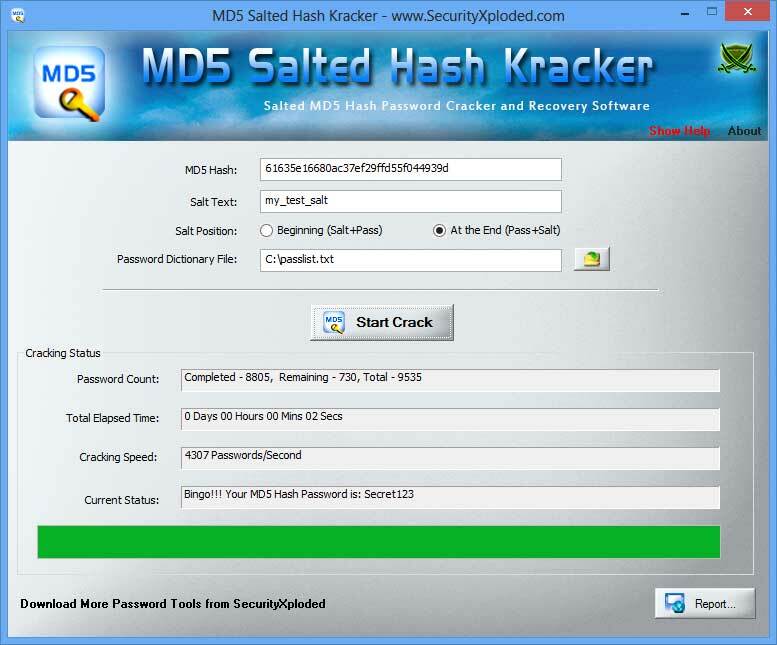 MD5 Salted Hash Kracker is the free tool to crack and recover your lost password from the salted MD5 hash. These days most websites and applications use salt based MD5 hash generation to prevent it from being cracked easily using precomputed hash tables such as Rainbow Crack. 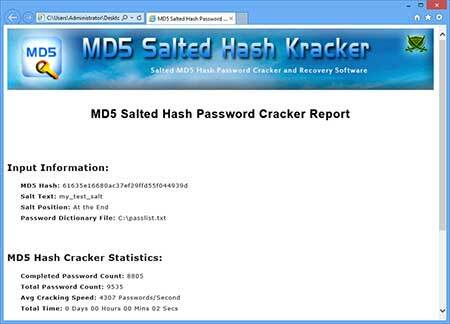 In such cases, 'MD5 Salted Hash Kracker' will help you to recover your lost password from salted MD5 hash. Though it supports only Dictinary Crack method, you can easily use tools like Crunch, Cupp to generate brute-force based or any custom password list file and then use it with 'MD5 Salted Hash Kracker'. MD5 Salted Hash Kracker also allow you to specify the salt position either in the beginning of password [ md5(salt+password)] or at the end of the password [md5(password+salt)]. In case you want to perform normal MD5 hash cracking without the salt then just leave the Salt field blank. It works on both 32-bit & 64-bit Windows platforms starting from Windows XP to new Windows 10 version. Free tool to recover your Lost Password from Salted MD5 Hash. Easier and Quicker to use with GUI interface. Generate MD5 Hash Password Recovery report in HTML/XML/TEXT file. MD5SaltedHashKracker comes with Installer to help in local installation & un-installation. This installer has intuitive wizard which guides you through series of steps in completion of installation. Launch MD5 Salted Hash Kracker on your system after installation. For normal MD5 hash cracking, leave the Salt field empty. During the operation, you will see all statistics being displayed on the screen. On success, message box is displayed and recovered password is automatically copied to clipboard. 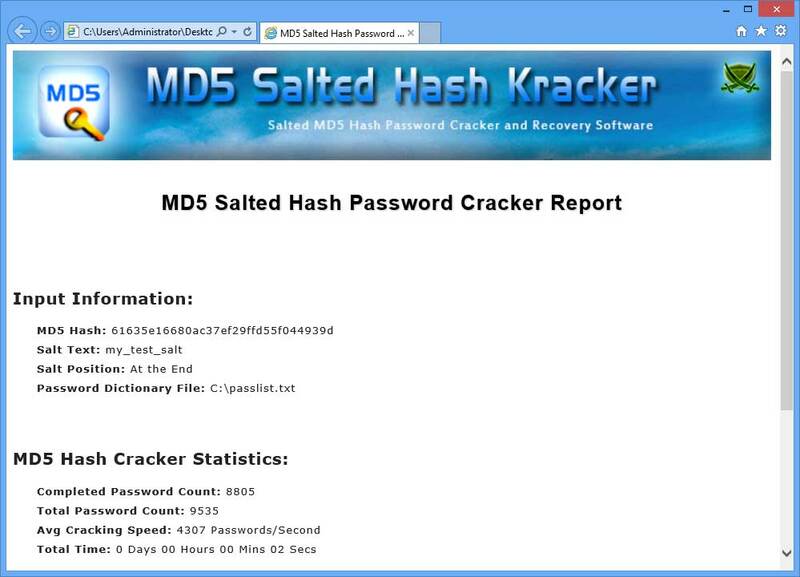 Screenshot 1: MD5 Salted Hash Kracker is showing the recovered Password for MD5 hash text. 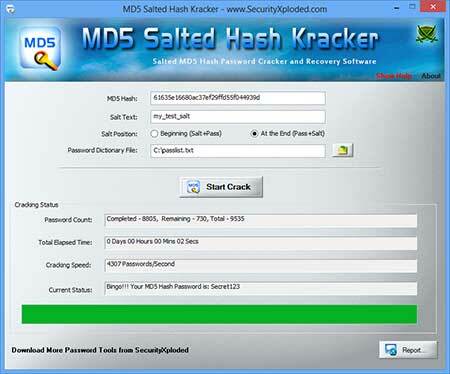 MD5SaltedHashKracker is designed with good intention to recover your Lost Password from MD5 hash. Like any other tool its use either good or bad, depends upon the user who uses it. However neither author nor SecurityXploded is in anyway responsible for damages or impact caused due to misuse of MD5SaltedHashKracker. Mega release with support for recovering Salted MD5 hash passwords on new Windows 10 version. Also fixed the sizing problem with higher resolution computers. New feature added to Installer to dynamically download latest version. Imrpoved GUI interface with magnifying icon effects along with few other changes. First public release of MD5 Salted Hash Kracker.